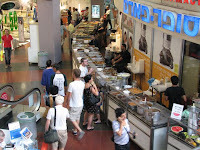 The food court is divided into numerous stands. The stands have huge metal plates on which the sellers keep the food warm. You can take a peek before you order and some sellers let you taste before buying a whole plate. Most of the sellers speak English, otherwise you just point at what you want to eat and they scoop it on a plastic plate for you. The prices differ a lot, so ask how much each item is before you choose. Note that there aren't any seats but you can sit near the stairs. For the meat lovers, we would recommend to eat at the Persian stand (on the 2nd floor near the escalator and sometimes in front of the Superpharm on the ground floor), where they sell kebabs, skewers, meatballs, stuffed vegs with meat, chicken legs. Try the rice before you add it to your portion, as they are not always tasty. The stand which sells tortillas with chicken or beef stew is also recommended. This stand also has vegetarian fillings, such as eggplant or bean stew. It is located in front of the DIY store. If you rather want to eat a light lunch, you can try out the small sushi stand. The sushis aren't the best in town, but they are edible. The Druze stand can also be considered as 'light food' and is located near the entrance. The old lady there sells Druze pita (looks like a huge pancake) with fillings such as parsley, cream cheese, labane (some kind of white cheese). Otherwise you can take the stuffed cabbage with rice which is a special Druze delicacy. The Food Court also sells drinks, fruit juices and lemonade. Next to the Persian stand you can buy almond 'juice' at the fruit stand. If you still feel like eating a desert, indulge yourself by going to the Poffertjes stand (Dutch mini pancakes) on the 2nd floor (or sometimes in front of the Superpharm) and order a portion with butter and maple syrup. It's a great way to end your tour at the Food Court. Currently the food court is divided to two floors - the bottom and the 2nd floor. The Dizengoff center is located at the intersection of King George and Dizengoff streets. The food court is located at the east side, at the bottom floor and on the 2nd floor. * Detail: There are water taps near the stands to wash your hands.